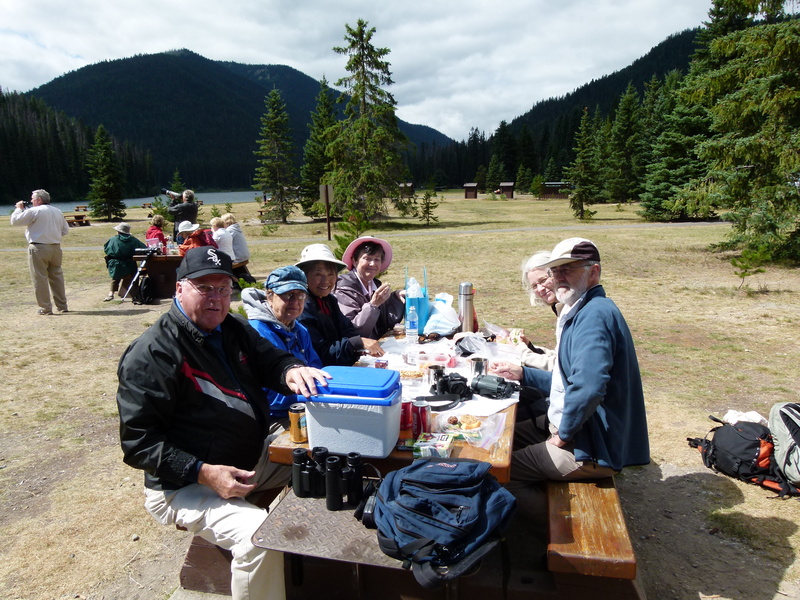 Fourteen DNCBer’s enjoyed a super “nature” Wednesday at Manning Provincial Park in the Cascade Mountains, located about 2 to 3 hours drive from Vancouver, between the coastal rain forest and the semi-arid Okanagan. We were four car loads: 1. Comedic Leader Roger M with Mike, Kay and the affable and first-time-sleeping-in Lorna; 2. our Guru Anne with Jane Z and former Nats Rick & Marg joining us from Vancouver Island; 3. Me with three Chick Photogs Kitty, Leona and Marian; and 4. Bryan & Janet who tented the night before at the Park. 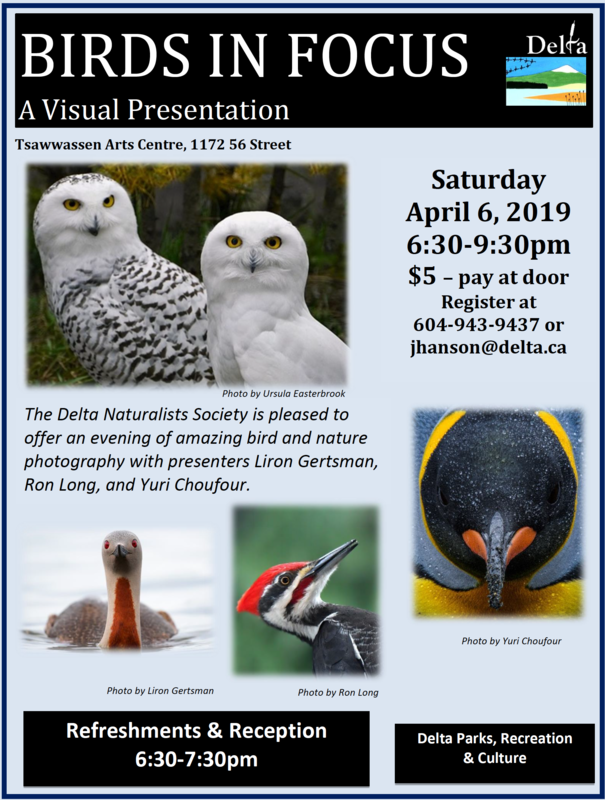 Hi-lites, supplementing the amazing vistas, were: several Blue and Spruce Grouse, Townsend’s Warbler, ground squirrels, hand-eating Clark’s Nutcrackers and Grey Jays and lots of gorgeous Wildflowers. There should be many photos soon on our Picasa site and on our DNCB Blog (first link in “Blogroll”, right column). Three carloads left from our new starting point, the Ladner Bus Exchange at 6:20 a.m. and drove leisurely eastward into the sun (and against the morning traffic), via Trans Canada Highway 1 and then Hwy 3 at Hope, meeting again around 8:30 a.m. at Sumallo Grove at the western end of Manning Park. Since we had told others (e.g. Bryan & Janet) that we would meet at the Manning Park Lodge around 8:30 a.m. we decided not to walk the trails in this typically western coastal vegetation area (like where we live) but to continue another 20 minutes to the Lodge. At the Lodge, after introductions, we wandered among the squirrel burrows in front of the parking lot. Both parent and young Columbian Ground Squirrels were everywhere and not afraid to eat nuts from your hand. 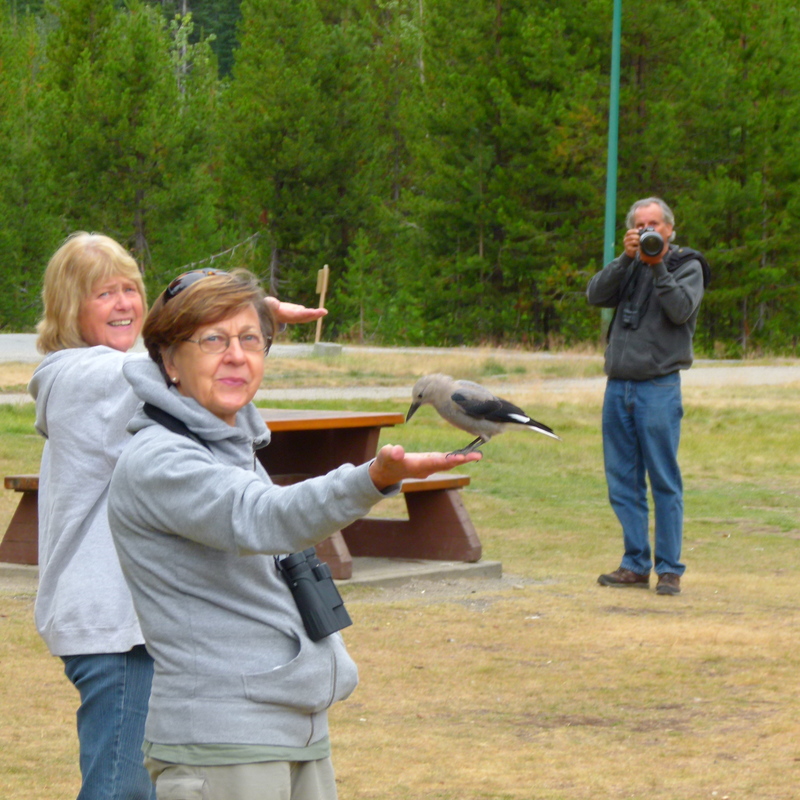 Clark’s Nutcrackers were also people-friendly and thrilled us all as they landed and fed on our out-stretched hands. Lookout “switchback” Road to a scenic lookout. On this drive, some saw a Yellow-bellied Marmot and others a Snowshoe Hare. 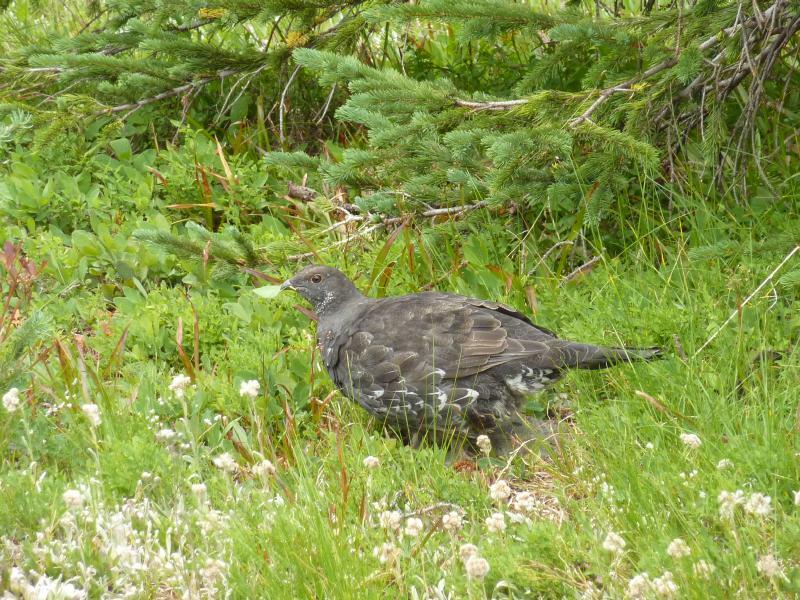 We stopped to photograph a female ‘Blue’ Grouse guarding her young as they wound their way in the grass along the road. 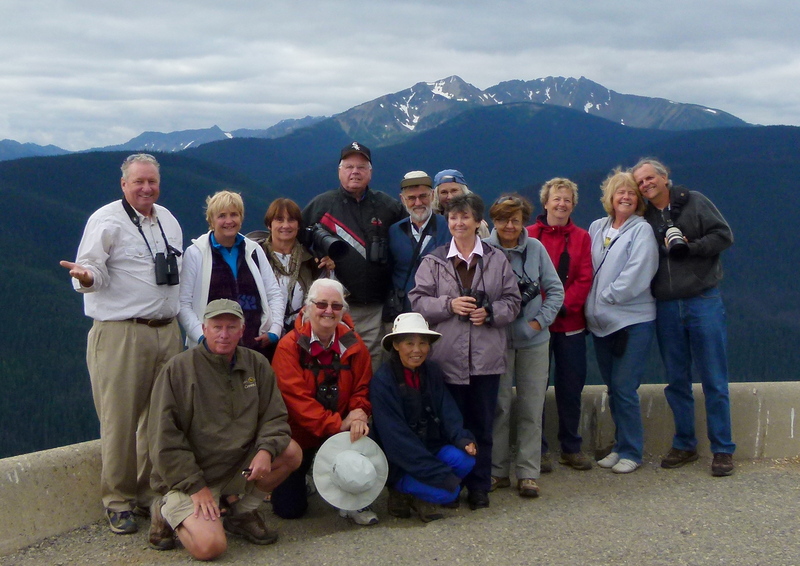 At the lookout parking lot, we gazed south at Mount Frosty and the snow-capped mountains of Washington State’s North Cascades National Park. Cascade Golden-mantled Ground Squirrels and Yellow-pine Chipmunks ate from our hands here as did the Nutcrackers and the smaller Grey Jays (aka Whiskey Jacks). 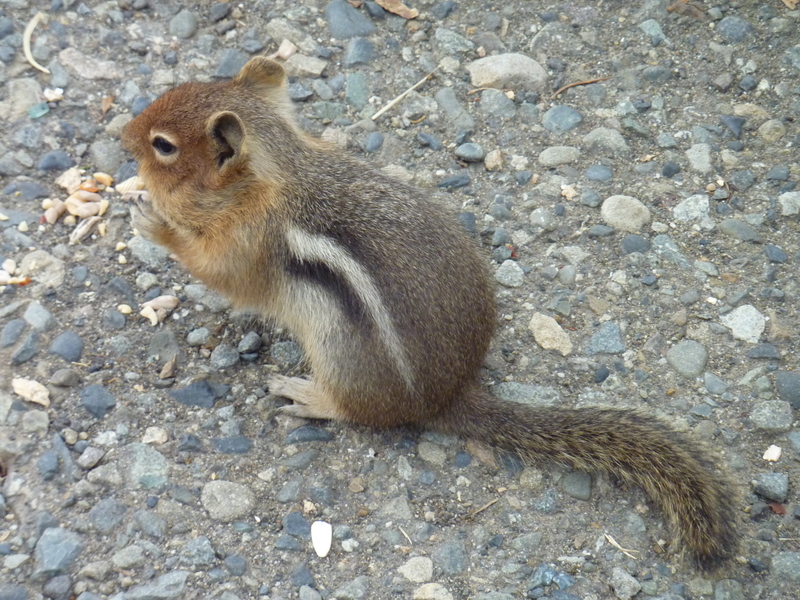 The ground squirrels are similar looking to the chipmunks but have one stripe only on their back, and not on their face like chipmunks, and are larger. Common Ravens scavenged leftovers. We continued another 4 miles up a dirt and dusty road to Blackwell Peak where we began our first walk. We followed Heather Trail for a mile or so and listened for Julie Andrews singing the Sound of Music. Surrounded by beautiful Wildflowers and rolling meadows it seemed like we were in Austria. We got a good view of a male Sooty Grouse here (Blue Grouse is now split into Sooty and Dusky species – both occur in Manning; the Sooty has a grey end to its tail. Hybrids occur and the one we saw might have had a bit of hybrid nature as it had quite a lot of whitish splotches – Ed). 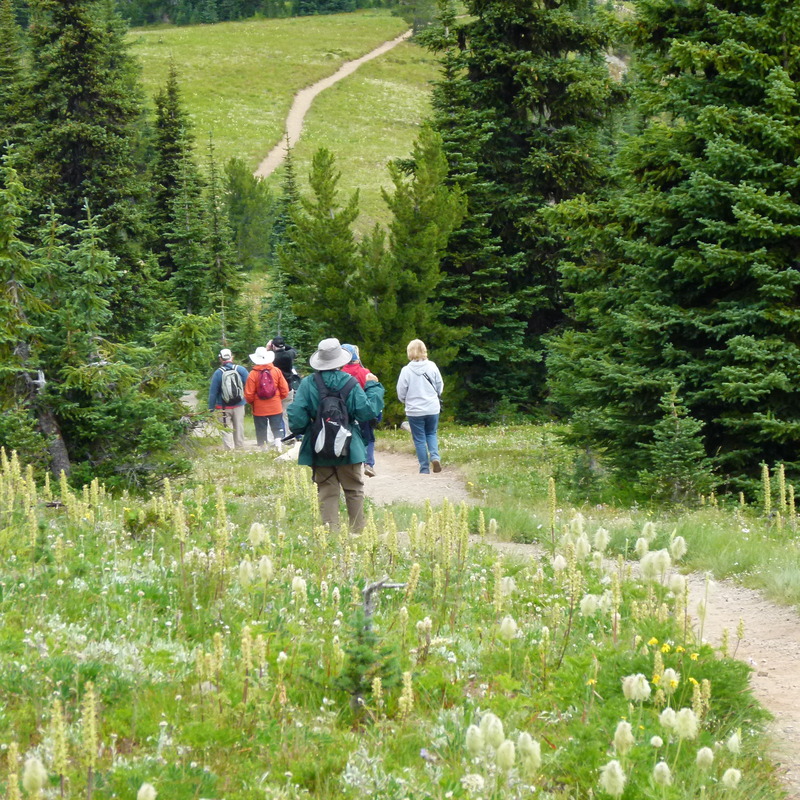 Manning Park is famous for it diversity of rare and endangered flowers and plants. 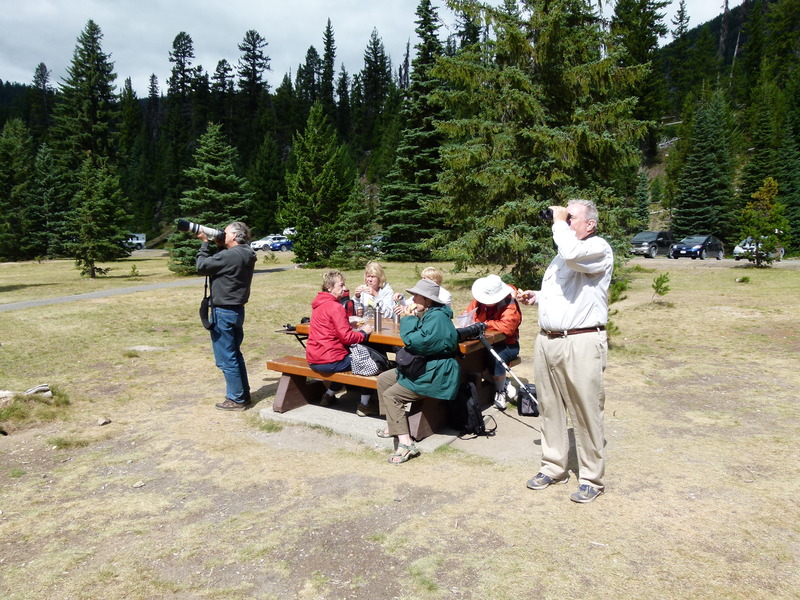 We were fortunate to have Experts Roger, Anne and Janet to ID and describe many that we saw. A few names I recall hearing and seeing (but will forget tomorrow) include: Western Anemone, Red Indian Paintbrush (also a Trail Name), yellow Arnica, poisonous Indian Hellebore, blue Broad-leaved Lupine (seemed shorter than our Delta Lupine), Partridgefoot, Subalpine Daisy, Bladder Campion, Leafy (?) Aster, Yarrow, Roger’s favourite food poisonous Baneberries, Foamflower, Bunchberry and Common St. John’s Wort. I’m sure there will be photos of these and other colourful wildflowers on our Picasa site. Not many birds on the trail, but we did get a good look at a nice male Blue Grouse, a Turkey Vulture, Steller’s Jay and some Juncos. It was around Noon when we got back down the hill to the picnic area at Lightening Lake. Here the gourmet delights unfolded, including Lorna’s, Marg’s and Jane’s PB and egg sandwiches, various veggie concoctions, and Kay’s weird biscuits. Only Rick, Mike and I drank disguised coke. An Osprey, successfully diving for fish was lunch entertainment, along with more hand-feeding the begging Nutcrackers and Whiskeyjacks. 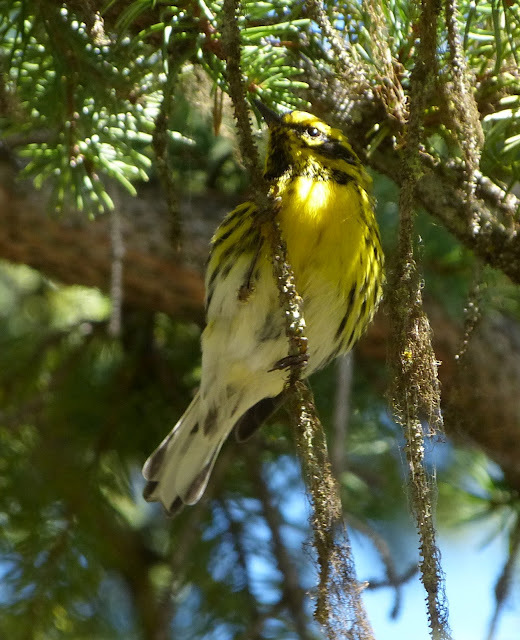 Violet-green Swallows flew past and then Janet spotted a beaut male Townsend’s Warbler flitting in a spruce tree. Our photogs struggled to get shots as it kept darting behind branches. We drove a little further and walked another Trail (?) along a creek, lined with Lodgepole Pines, where people were canoeing and kids were jumping off a bridge into the very inviting water. Again, not much bird action; we saw a Song Sparrow “anting” and a few other unidentified LBJ’s. 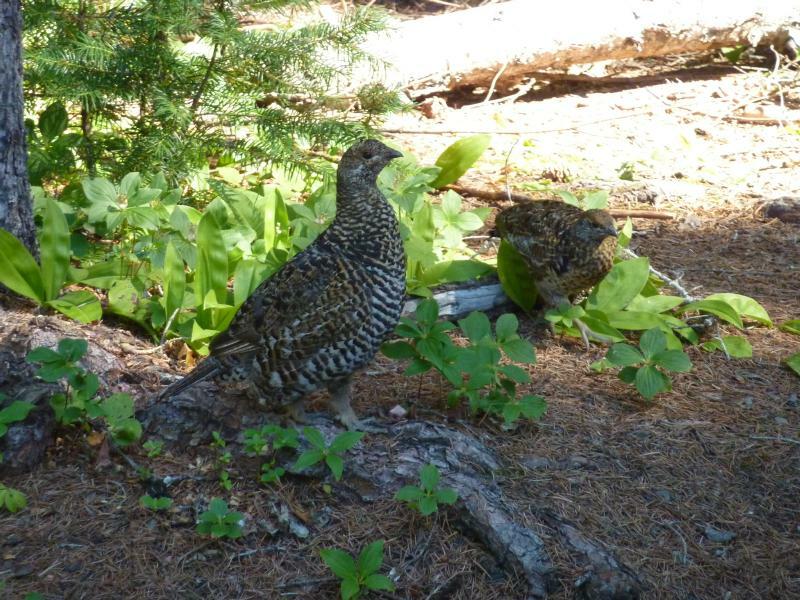 A mother Spruce Grouse shepherding 5 babies through the shrubs thrilled us. 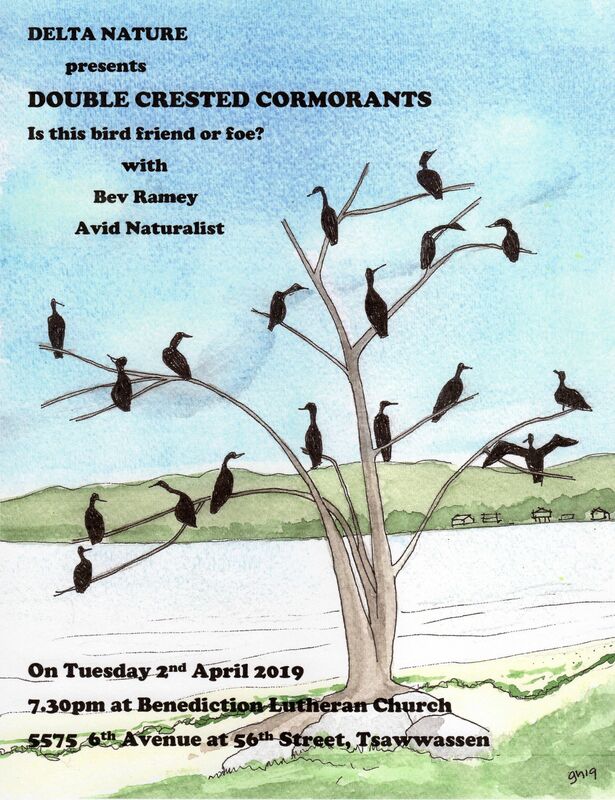 Lots of evidence of woodpecker activity but we were blanked on the Three-toed Woodpecker. We left the Park shortly after 3:00 p.m. and began the comfortable but drowsy drive home. Marian’s gibberish, Leona’s insight (or incite) and Kitty’s jabs kept me awake for most of the way. The drive along the US border road, Zero Avenue, was especially interesting (e.g. raspberry fields, drug tunnel, etc). After dropping Leona in White Rock and Marian and Kitty at the Ladner Bus Exchange, I got home shortly after 6:00 p.m. and then spent two hours scrubbing the dust and bugs off my SUV. It really was an awesome day of experiencing a new (to me) and different area of beautiful BC with an eclectic group of interesting and nice folk. 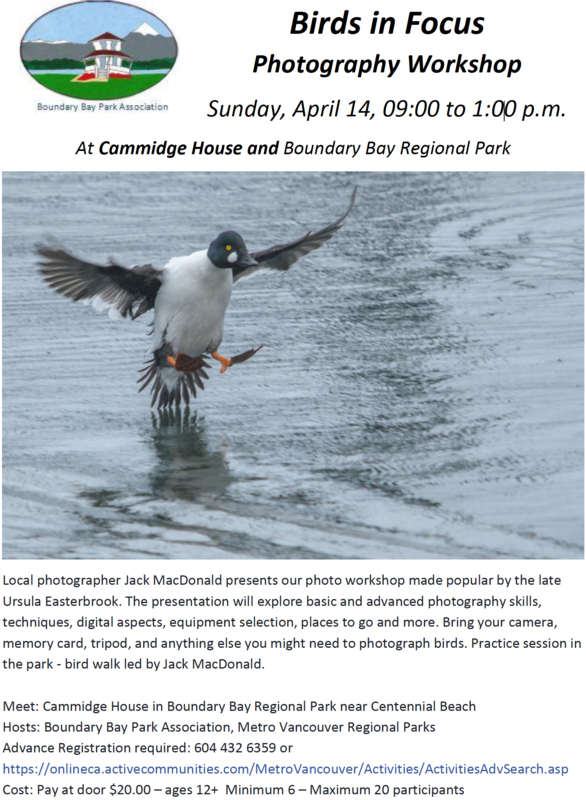 This entry was posted in *DNCB, Blue Grouse, Manning Park, Osprey, Turkey Vulture. Bookmark the permalink.